"Jesus talked a lot about money, and we believe that clergy need to as well, helping parishioners move from an attitude of scarcity (money is mine and I need to hold on to it tightly) to abundance. The best way to break the power of money is by giving it away." That's one of the theological perspectives embraced by Philip and Janet Jamieson, keynote speakers for the Foundation's fifth annual Stewardship Summit, set for Sept. 10 at the First United Methodist Church of Orlando. The Jamieson's participated in an advance interview with writer Jim Frankowiak, to discuss their work with pastors, business administrators, finance and stewardship chairs and others involved in congregational life. The couple met while Phil was a seminary student and Janet was working on a graduate degree in business. After Phil devoted more than a decade of service to churches in the East Ohio Annual Conference, and Janet worked in public accounting, the Jamieson's moved to Dubuque where they both took teaching jobs. 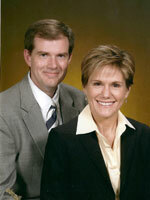 Phil is on the faculty at the University of Dubuque Theological Seminary and Janet at the University of Dubuque. Their unique combination of theology and finance led to an invitation to teach a seminary class on stewardship. That initial class led to others and the reception was such that the Jamieson's decided to co-author a book based on course material. The book, Ministry and Money: a Practical Guide for Pastors, was published in 2009 and has led to group presentations, such as the Stewardship Summit, across the country. These presentations have given the Jamieson's enlightening insights into the church today. "There is an overarching tone of concern that the church has reached the point of diminishing returns regarding the funding of ministry," they said. "Pastors and laity alike are paying attention to the unsettling fact that the traditional primary givers are dying." But some people are asking different questions. Some ask "how do we survive?" "We understand that question to come usually from a human-centered vision of scarcity. But others are asking "What aspect of God's work are we being called to join?" We understand that question to arise from a theocentric vision of abundance with God as the provider of all resources. That is an acknowledgement that none of what we 'own' is really ours, but that all things are a gift from God. So rather than hoarding those resources and focusing on how they may run out (scarcity), this understanding challenges the believer to give freely knowing that all belongs to God. "We try to help people understand the power that money holds in their lives. Part of this is to challenge clergy to talk about money, since it is such a dominant force in our culture. Most of the time, clergy say very little about money except when they ask people to give it. And yet money occupies a central position in most of our lives. When money isn't discussed in the church, the implication to the parishioner is that this is an area of our lives over which God has little to say. This silence allows the power of money to grow in our lives, unchallenged by the gospel. Jesus talked a lot about money, and we believe that clergy need to as well, helping parishioners to move from an understanding of scarcity (money is mine and I need to hold on to it tightly) to abundance. The best way to break the power of money is by giving it away." The Jamieson's, who will keynote the summit, will help participants develop a theology of money and adapt stewardship practices that will foster a climate for giving. Phil will lead a breakout session entitled "Motivations for Giving, a Theological Analysis", while Janet will address "Strengthening Money Leadership". Rev. John Peterson, Vice President of Planned Giving for the Florida United Methodist Foundation, will present "How to Implement a Successful Planned Giving Program for Your Church." Foundation Vice Presidents Tom Wilkinson and Suzanne McGovern will co-lead a breakout session entitled, "How to Communicate a Language of Giving Across Generational Lines." Registration, which must be completed by September 1, is available online at www.fumf.org or by calling toll free (866-363-9673).